When Minnesota-based Cash Wise store director Ranji Lachmensing heard about a supermarket who had set a record for the world’s largest display, his first thought was, “hey, we can do that.” And not just beat it by a little—by a lot. So, they went big. 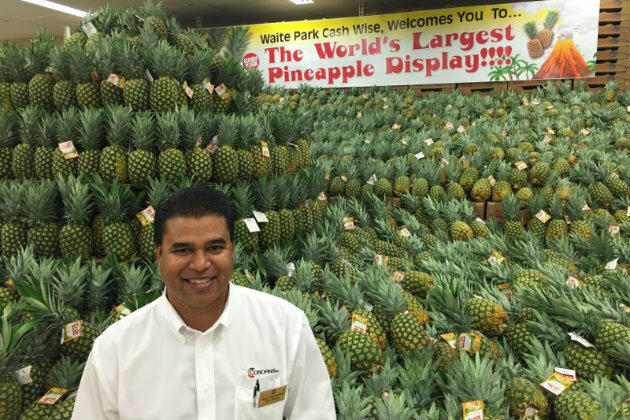 In May of 2016, after working with partners Dole and Russ Davis to secure enough pineapples, the supermarket unveiled the world’s largest pineapple display featuring more than 16,800—two full truckloads—of Dole pineapples. It also featured a 15-foot volcano in the middle, complete with smoke rising from the top. The entire produce staff was involved with the project, including a team of 10 employees that began constructing the display at 2 a.m. They finished six hours later with just enough time before shoppers were invited to visit. Consumers were eager to see—and buy—the pineapples as well. The store sold 21,315 pineapples in total, so many that Cash Wise had to bring in an additional truck load to support the promotion. Best of all, the display wasn’t just a fun way for the store to kick off the summer. 25 cents from each pineapple sold, or $5,000 in total, went to the Coborn Cancer Center. Through a seamless fusion of electronic, print, and social media marketing, it turned out to be a fun and highly successful event. Not only did it give back to the community and build customer loyalty—Cash Wise gained recognition as a leader in the supermarket industry. The supermarket beat dozens of entries to be recognized for the year’s best merchandiser award in the charitable cause event category at The NGA Show 2017. Now it’s your turn. If you’re planning on putting on a creative program, campaign, or event like Cash Wise, we want to know about it! The annual Creative Choice Awards contest, presented by Kellogg’s and Unilever, honors and recognizes the best marketing and merchandising programs throughout the industry. With 11 different submission categories, from store opening to public service, there’s something for everyone.